While it's always best to step out for dining when aboard a Princess Cruises ship, there are those times when room service just fits the mood. This can be especially true before or after one of those exciting but exhausting shore excursions, and other times when R&R in the cozy comfort of your cabin has the makings of a perfect memory! 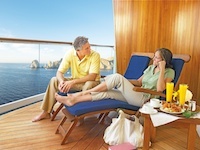 Breakfast fare, soups, salads, specialty sandwiches, pizza, and desserts are on the Emerald Princess room service menu. Main dining room entrees are also available during regular hours open. With the exception of a 3 USD delivery charge for pizza, food is at no additional cost. Beer, wine, and sodas are at current menu prices. There is a charge for hors d' oeuvres for parties. There is no charge for food, but beer, wine, and sodas are at current menu prices. State room guests may check in their portfolios for room service menus and may choose continental breakfasts by filling out the order card and hanging it on the door. There is a 3 USD delivery charge for pizza. After a long day of sightseeing room service can be a great, relaxing alternative but it is usually worth the effort to step out for casual dining on the Emerald Princess.